Some characters from my own things that I turned into Drifters. In order, it's Cole, Reiciel, Maki, Clarke (female and male), Jaunt, King and Roman. Roman doing some attacks. First is a Electric Palm Strike, second is laser knife, last is totally a sword swing and not a frisbee. I mainly used the shading from this guy, who has two shades of muscle definition. Smaller characters like the Drifter and the Schlaepfer Knight have one shade. I'll try out making a Drifter style character and keep the one shade in mind. I assure you, it's not based on Fireman. The underpants are intended to be armor, same with the arms, legs and helmet. It could do with being more HLD inspired, though, if I didn't get the point across. 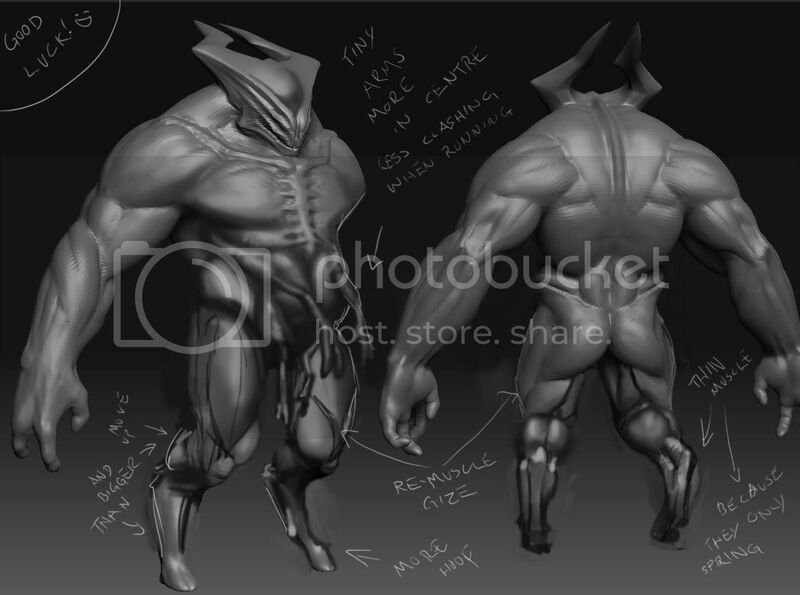 I'll rework some stuff and then get started on a Drifter. Your help is appreciated. Good start and the helmet design is really neat, but maybe try for a more complex pose? You are also pillowing your shading a little bit by outlining the arms and the helmet. The HLD art style has the light source hitting very directly with no buffer shades. You shouldn't bother with internal AAing or anything because HLDs style is accentuate the pixel and focus on dynamic shapes, block shading and bright harmonious colors. There is actually very little traditional pixel tech going into it, which part of what makes the style so fresh and engaging. The three Drifters are hood and full gas mask, mouthpiece gas mask and goggles and then scarf. I removed the extraneous machines from it's back and gave it fur stuff to make it more like a race or something along those lines. Much better. By removing "extraneous machines from it's back" you increase readability, and black was good choice to balance all that red. There are still some problems with his feet, they don't have good shape, and you should remove those black pixels near his thumbs. As an alternative to HDMD's suggestion (sorry bro, your screen name is too damn long) how about making the area next to the monster's hands a different colour, so the blue from the hands doesn't crash with the blue or red from the legs? Would give better readability. i think u have too many bright red detail points for a sprite this size which flatten him out. also notice in ur reference image the use of heavier contrast on focal points such as hair and helmet (in that order to my eyes)? then u have things like the gun tip (I think) carefully using a bright colour that can be easily read without looking directly at it. A Light, Medium and Heavy Attack. All are obviously derived from the Heavy, but I changed some minor things like leg placement and the Light being an electric palm strike. And messed with this guy's legs and wrappings. Longer legs definitely suit him more.